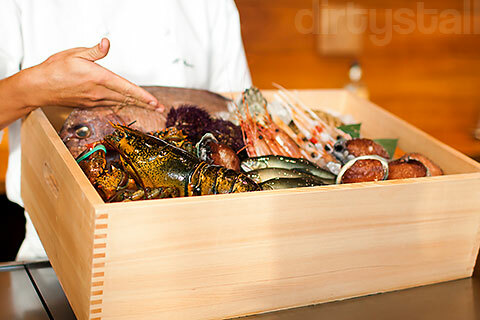 Waku Ghin is Tetsuya Wakuda’s new restaurant at Marina Bay Sands, and it’s also his first restaurant outside of Sydney where he has been running his famous namesake restaurant Tetsuya. 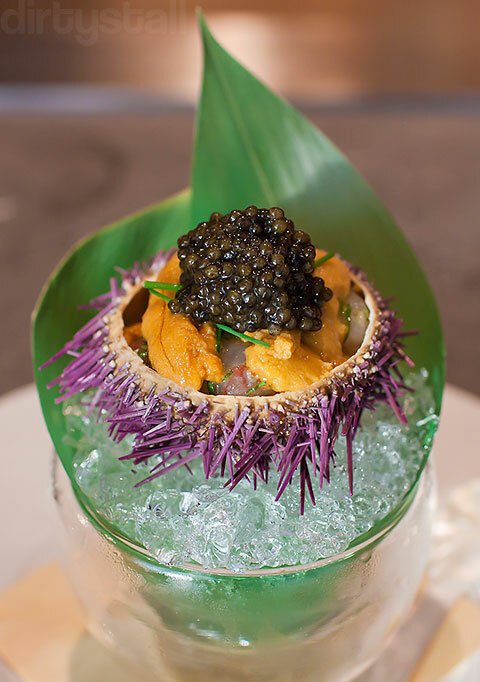 Being the last of the 3 celebrity restaurants to open, Waku Ghin has garnered a lot of talk about it, from the costly degustation menu to the 25 seatings in just 10,000 sq ft. However, I feel that the extra time spent to develop Waku Ghin was well worth it as it has attained the high standards of service and quality that Tetsuya wanted it to reach. The doors to Waku Ghin are closed but as you approach, they open magically as if automated but in reality the attendants behind the door are always watchful and ready to open them for approaching guests. Already I feel welcome! 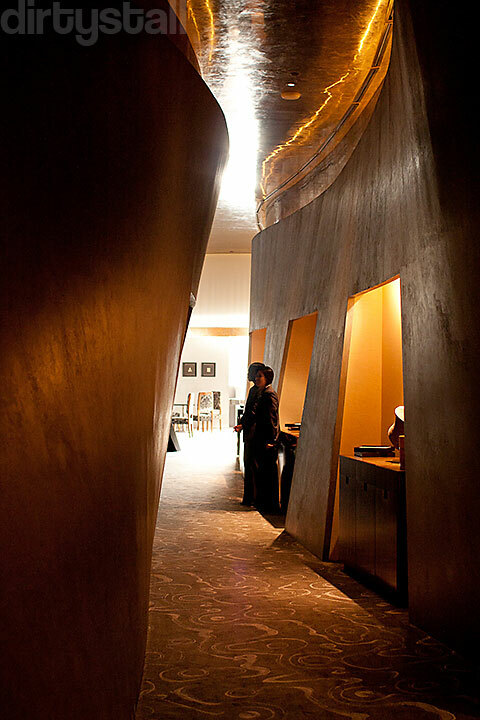 Once inside, the warm mood lighting sets the tone for the meal and the curving walls invite you to explore the restaurant deeper. There’s a certain austerity to the interior design, with the wooden panelling bringing warmness thats balanced by the cold steel. The 25 seats of Waku Ghin are divided into 3 rooms of 6 seats and 1 counter of 7 seats. 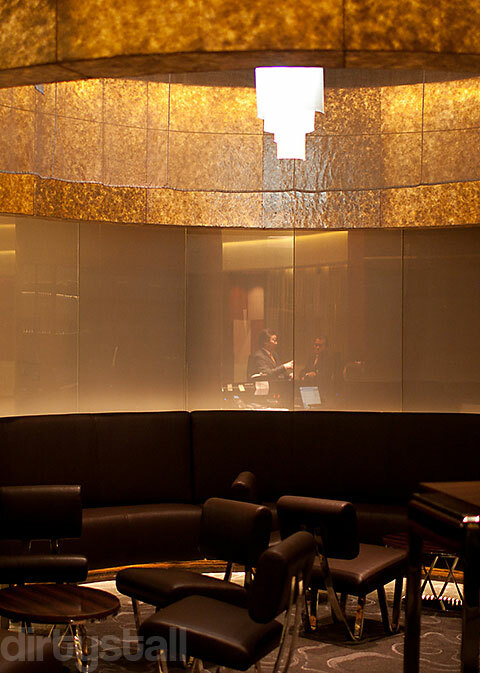 The rooms are used for groups while the counter is meant for individuals or couples. The standard of service here is extremely good, and the maître d’ who met me at the door made pleasant small talk with me as he showed me around the restaurant, explaining the concept and cuisine of Waku Ghin. Once seated at the counter, there was always a waiter or waitress nearby, just out of sight so as not to let you feel watched but yet instantly there at your call. They were all also very knowledgable about the dishes and attended to us like we were royalty. 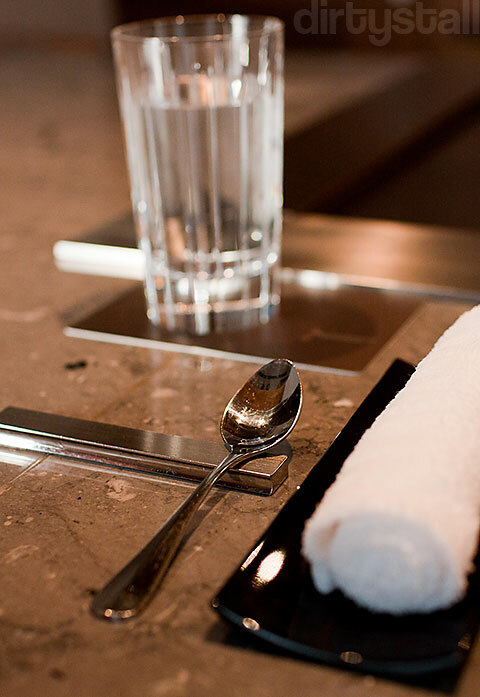 There were all sorts of small details, like the chefs never showing their backs when leaving the counter kitchen, or adjusting the lights to our comfort level. 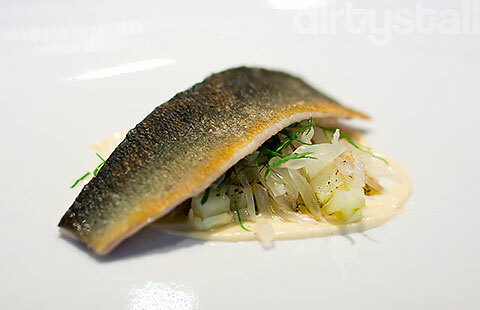 The food itself is what I would call an European take on the Japanese kaiseki meal. 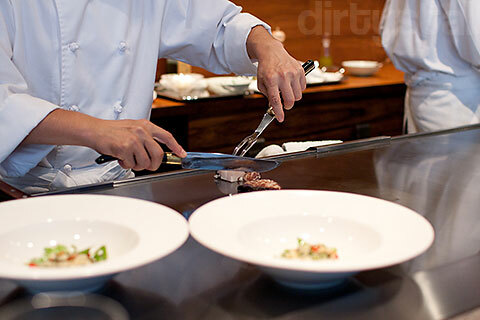 Instead of the complicated cooking techniques, multitudes of ingredients and complex plating commonly seen at top restaurants, the dishes here are composed of luxurious and fresh ingredients, simply cooked but yet with strong sense of cohesion. 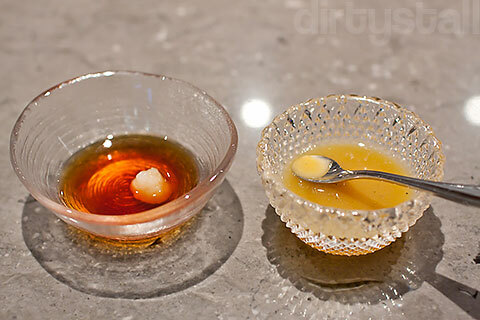 I was told to eat this amuse-bouche by first sampling a little bit of the sauce then eating the scallop whole. 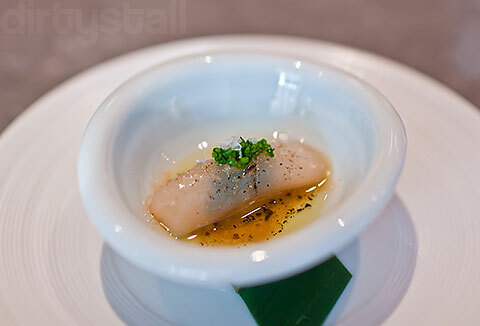 Despite the weird name, everything went together perfectly and there was a little bit of foie gras and nori inside the rolled-up scallop to provide some taste to the softness of the scallop. The salty but piquant sauce complemented the scallop and made it feel like you were eating an oyster instead. Definitely interesting but too bad it was so small! This dish looked rather sparse at first but tasted quite good actually. The bamboo clams are first blanched lightly then sauteed, hence being twice-cooked. 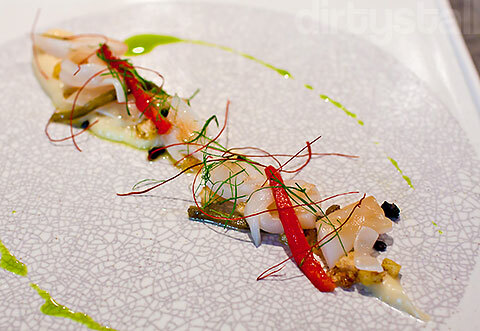 The texture falls between a squid and scallop, with the taste being enhanced by the strips of chilli, parsley oil and salty croutons. Near the end of the dish the garlic cream finally came into play, a bit more foamy than expected. A nice build-up from light to heavy flavours! I have to say that this is one of the most perfect pieces of pan-fried fish I’ve ever had. It practically disintegrated in my mouth but yet the skin retained its crispiness and flavour. The daikon cubes were there mainly for contrasting texture to the fish and the fennel balanced them out with the pomelo bits. 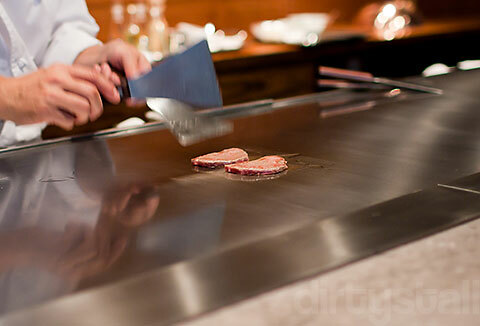 At this time, the teppanyaki grill was finally being used! At its heart this is a really simple dish done really well. 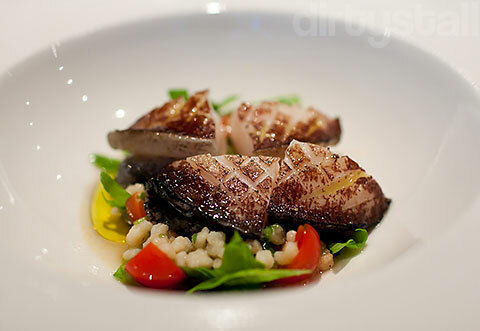 One large whole abalone grilled and sliced into pieces, placed on top of fregola and some tomato salad. This tiny slice of beef is from Cape Grim in Tasmania, organic and 100% grass-fed, and it was probably the best piece of beef I’ve ever eaten. 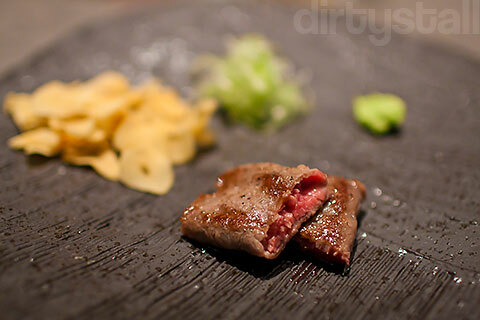 It was intensely full of flavour due to its grass-fed nature but still tender unlike normal grass-fed beef. No doubt the marbling helped as well! I even finished the salad, such a rare occasion! I can’t remember what oils or dressings they tossed the salad with but it was delicious! All in all, my favourite dish of the night, even over the 2nd one! I really savoured every last bit of it and wished for more! The 2nd beef dish of the night, Australian Blackmore wagyu of marbling grade 9. 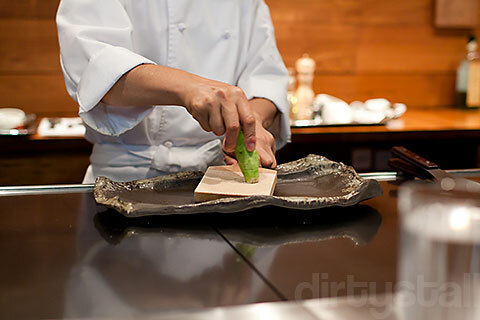 First the chef grinded out some real wasabi with a sharkskin grater and arranged the plates with the condiments and sauces. 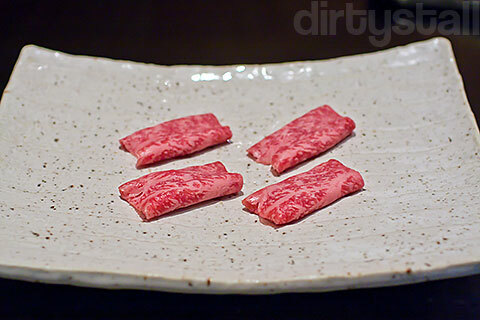 Then he cooked the wagyu rolls quickly and served them with 2 sauces. 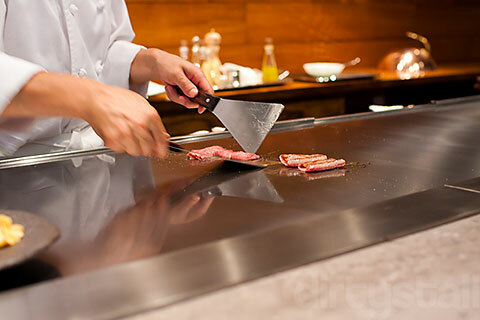 The chef then directed me to eat the wagyu in 2 ways: 1st was to dab a bit of wasabi on top then dip it in the citrus soy sauce, and the 2nd was to add some spring onions and scoop a bit of the egg sauce over it. 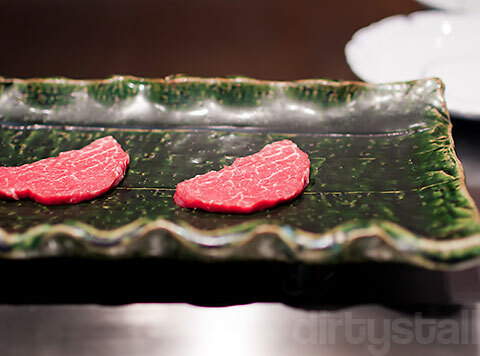 Both sauces did widen the experience of tasting the wagyu but luckily he served another set because ultimately I preferred the taste of eating it naked without sauces. Soft, fatty and delicious! The maître d’ asked me to compare this to the previous one but in the end I still preferred the Cape Grim beef because it was just so potent in the flavours! The final dish was a rice dish, which is how a kaiseki ends as well. Based on the various reviews I’ve seen so far, this dish tends to be the one that changes the most. For me it was a crystal-clear chicken consommé with rice and slices of red snapper. 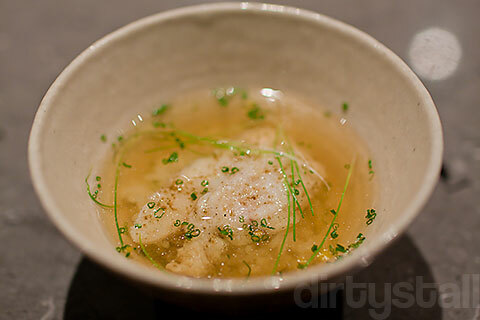 The consommé was clean and strong with the essence of chicken, and I could also feel hints of yuzu dancing in and out of my mouth, with a very subtle tone of wasabi; both helped to freshen me up. 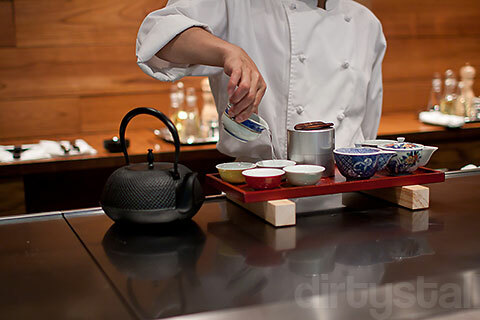 Before the desserts, there was a break for a minor tea brewing ceremony. The waitress informed me that this was Tetsuya’s way of thanking the diner for eating at Waku Ghin. The green tea used was gyokuro, a fine and expensive tea leaf from Japan. It is grown in the shade unlike normal green tea which is in the sun, and harvested very young, about after 2 weeks. 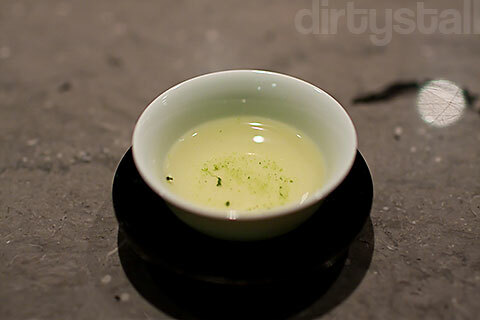 This makes the gyokuro smoother and more full-bodied, rich with umami. Although gyokuro can be found in other top Japanese restaurants here, the waitress told me the one served at Waku Ghin is special because Tetsuya is friends with the owners of the gyokuro farm in Japan hence he can get a higher grade of it to bring in. To be honest, I’ve never had gyokuro before so I can’t really compare or verify this. 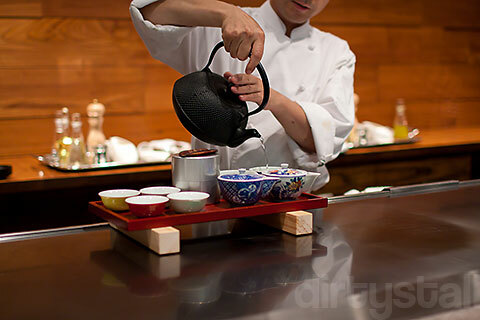 As gyokuro is steeped at a low temperature (60°C), the serving cups are warmed up with hot water first which also serves the dual purpose of cooling the water down. I have to say they weren’t bluffing about the rich umami flavour, which is sweet and delicate on the tongue. No bitterness at all here, just one of the most amazing cups of green tea ever! Next we adjourned to another room to have desserts. 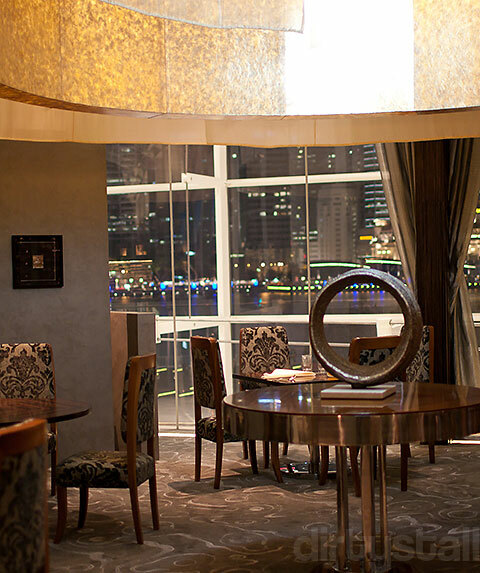 This circular room has a pretty great view of the Marina Bay area. 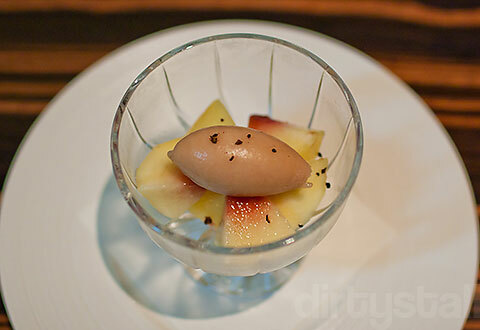 An incredibly sweet and juicy Japanese white peach, topped with a peach sorbet that compounded the sweetness. I think I like this fruit even more than Kyoho grapes! Seems like Japanese white peaches are pampered a lot while growing up, with a paper bag tied around them to protect them from insects, sun and bruises. This lemon curd cheesecake is one of Waku Ghin’s signature desserts and it was served with some extra sides as part of the birthday wishes from the restaurant. The cheesecake itself was so light and ethereal, I really liked how the sour notes of the lemon were just mild enough to be noticed but not overpowering on the tongue. A perfect cheesecake! 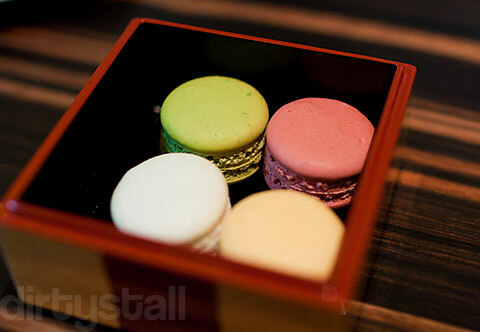 And finally the petit four was a small box of 4 macarons. Vanilla, banana, green tea and raspberry – each one was so light and crumbled away to reveal the flavoured cream and what seemed to be tiny pieces of fruits inside. I’ve never had macarons before so I don’t know how good these were but they were very awesome for me. 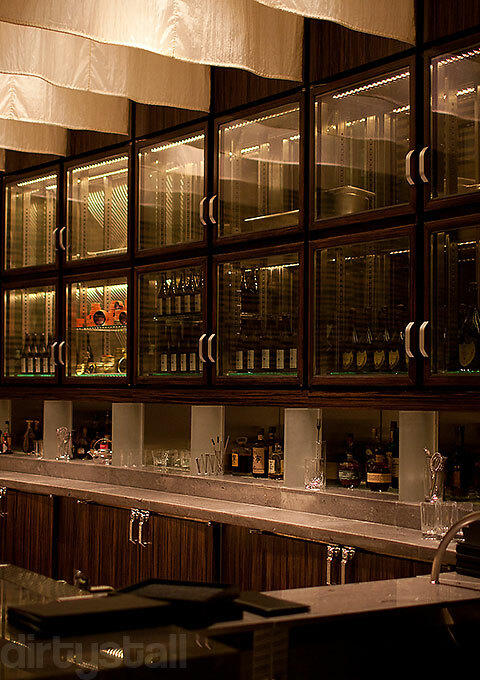 In conclusion, Waku Ghin is an amazing experience – the service, food and ambiance was incredible! 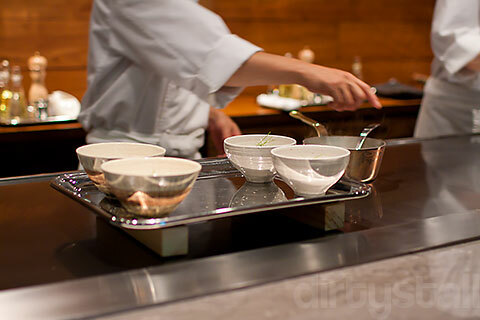 However, the food might not be for everybody as it is inspired by the Japanese kaiseki style of light and simple cooking. 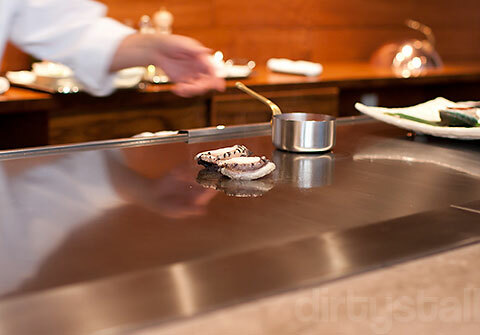 But if that’s the cuisine that you love, then Waku Ghin is worth the money for a once in a lifetime experience! 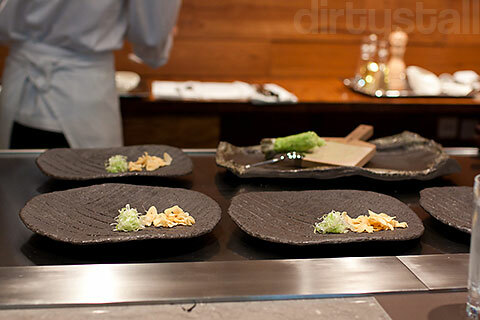 40 Responses to "Waku Ghin"
hi, is there only 1 tasting menu for all, or are there any options? am thinking of indulging for my bday! Heya, basically they will ask you at the start what you can’t eat so they will adjust the menu based on that. For example if you don’t eat beef then they will replace the beef dishes with fish. You can also call for extra dishes like you see that lobster in on of my photos was an extra. However if you mean like different dishes from my set (which was the base one), I think they can customise based on your budget, more money = better dishes! 😀 Best to call up and find out what else they can offer. actually they basically only have one degustation menu and they will only provide the menu list to you at the end of the meal. 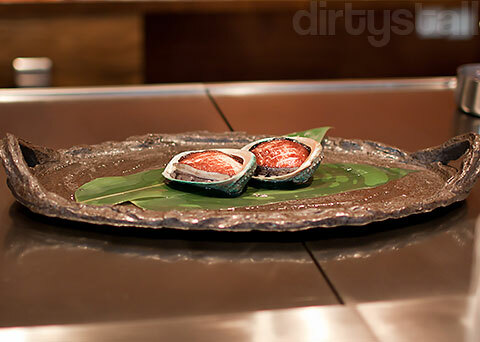 I attended the restaurant last week and the only thing that is different to the above menu is that an Oyster, instead of Scallop, was used for the first dish. And the dish with the Ayu was slightly different. Hope you have a good birthday btw. Hahaha I feel that Waku Ghin is like Goto with super service and higher class ingredients except it doesn’t have that authentic Japanese feeling as Goto, which uses more native Japanese ingredients. Thanks! Yeah the style of food is an interesting fusion, esp if you’ve had both types before. It was all very simple food but done flawlessly! Yes I totally agree! Sometimes it is actually harder to make simple food taste great. 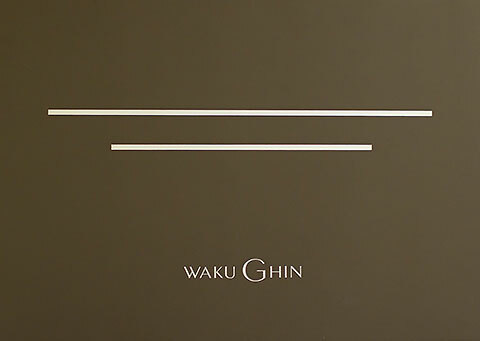 More skill and technique is needed and that’s something that Waku Ghin has done pretty well. if only my birthday was like yours, haha! how much did u pay? *envious* same here! haha i wish they’d sell the macarons by themselves so that i can see how they live up to those from the legendary pierre herme! superbly fine. do they have a set cost or something? Wow! Yeah looks nice! $400 per pax – wow! Heys, but what you had does look a lot better than a said restaurant in the other IR that cost was it $750? Looks like an excellent meal with classy ambience to boot! Thanks a lot! 😀 Yeah the meal looked better than that other $750 one, which looked rather normal if you ask me. This place got top-notch service! The restaurant looks great and the food very creative. Looks like I’ll need to find an excuse to go there! The pictures and description makes me so tempted to call them up now and find out what they have got to offer! Good post! $400 per person looks expensive. But from the way u described it, it sounds worth it. Thanks! The food is certainly expensive but I think the premium you’re paying is for the service and ambiance as well. 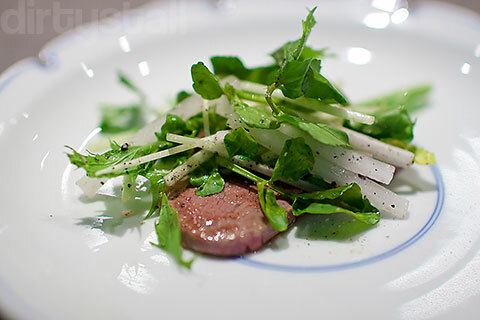 Very nice review, but can I just mention that Cape Grim beef, while delicious, is NOT organic. Ah ok, I must have gotten it wrong about the organic part then. 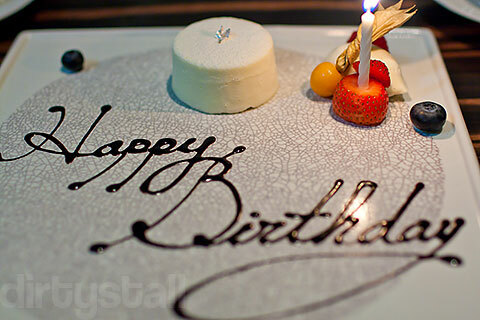 i celebrated a birthday at waku ghin last month and two guests got sick after the meal. informed the restaurant and asked them to investigate. they totally ignored our request and have yet to issue an apology. Such arrogance is just unacceptable. I have been a huge fan of Tetsuya for years but after this experience, i wil never patronize his restaurant again. my partner and i both got food poisoned from dining at waku ghin last month! which government dept. should we report this incident to, does anyone know? Good review – thanks. I wanted to write something after our visit, but it makes more sense to add some thoughts here. Our party of four had a fantastic dining experience, and yes we were pleased it is not Tetsuya Mark II. Not that this would be bad, but the thing is this a new dining experience – and we thought it was fantastic. Our chef and waiting staff were incredibly professional, and the food was amazing. We had a slightly different menu to the one you have outlined, but many items were the same. A highlight for me was the Wagu beef (never before have I tasted meat as good as this), and the consommé chicken broth – wow! The fresh wasabi was a revelation too. All up, a fantastic night of fine food and great company. Thank you! Good to hear that you had a great dinner there Scott! I totally agree with you on the service standard of the staff, it was very professional. And as you said, the food was excellent and I was also blown away by their 2 beefs, didn’t think such small pieces of beef could be so flavourful!